“Trust him at all times, O People” Psalm 62:8 Psalms contains the praises of the people of God. It is the people of Israel’s creed. But more than that, they reveal historical personal accounts which demonstrate how the people of God are to put their trust in God in every circumstance and they display the character of God who is majestic, sovereign, and compassionate and the creator. Mentor Commentaries combine the high view of scripture with access to the latest academic theological research. This unique combination allows the reader to see what recent scholarly research has discovered without losing sight of the inerrancy of scripture. 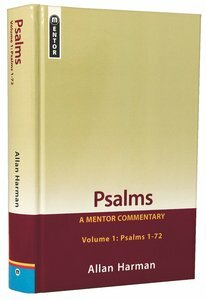 About "Psalms : Psalms 1-72 (Volume 1) (Mentor Commentary Series)"
Rev.Professor Harman (ThD., Westminster Theological Seminary, ThD., (honoris causa) Australian College of Theology) has recently retired from the posts of Principal and Professor of Old Testament at the Presbyterian Theological College in Melbourne Australia. He has taught graduate courses at Ontario Theological Seminary, Toronto and Reformed Theological Seminary, Jackson. Prof.Harman is the author of a number of quite original commentaries Deuteronomy and Isaiah in the Focus on the Bible Series, and The Book of Daniel in the Evangelical Press Study Commentary. "A tour de force of conservative evangelical exposition. Massively researched, painstakingly explained, theologically nuanced, reliably expounded, simply expressed and sensitively applied; this volume will be of considerable value to all preachers and Bible students." - Stephen Dray. 623 pages, from Mentor.